We wrote this post a couple of years ago, but we’ve updated it with Long Tail Pro Cloud screenshots, so you can see how to use the new software to get the same results. 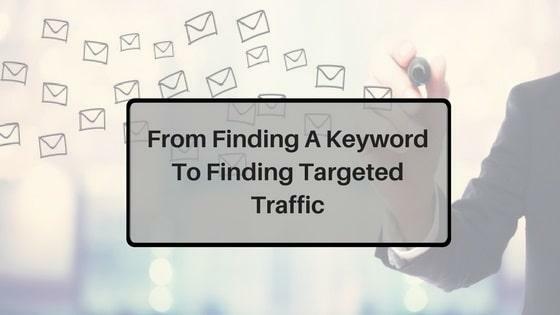 The original keyword this post was written around is a bit more competitive today, as expected, but the keyword research and outreach strategy outlined in this post is still very relevant today! And it works! We’re going to demonstrate, from start to finish, how you can use keyword research to find a low competition keyword via our tool Long Tail Pro, produce an excellent piece of content, and then promote that content to the right influencers via Ninja Outreach. 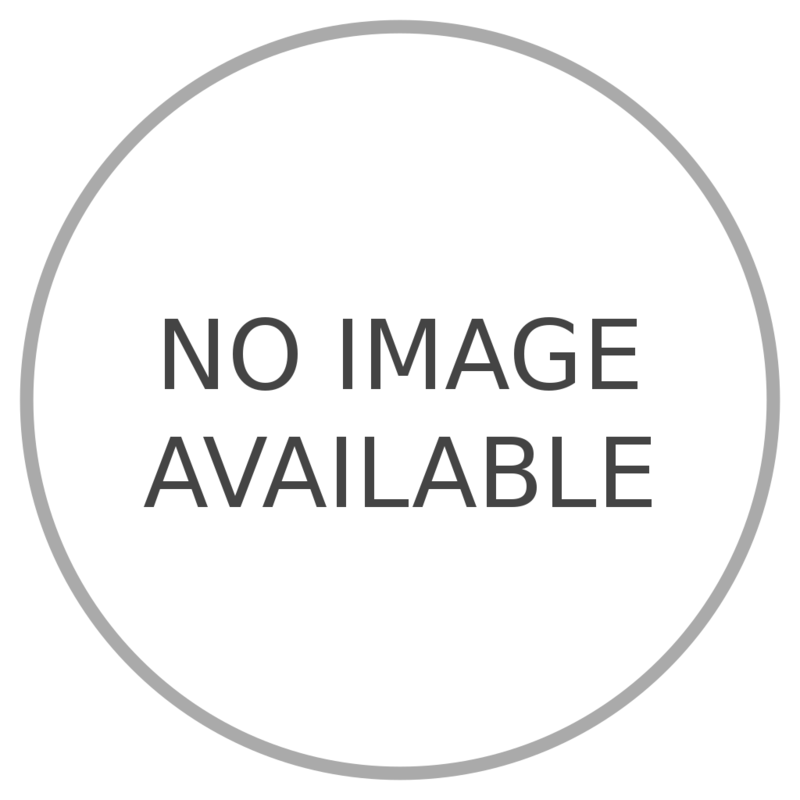 Our example niche today is going to be a blog in the nutrition/healthy eating category, but this technique can be used with any kind of site (including amazon affiliate sites or other kinds of niche sites). We’ve talked so many times about the importance of finding the right keywords to use with your website content. In short, if you are targeting keywords that are too general and too competitive, it’s going to be very difficult to rank highly for that keyword in Google. On the other hand, you may also be spending too much time on keywords that are hardly ever searched for. That means you could be ranking on page 1 of Google for that search phrase, but if only 5 – 10 people per month are searching for that term, it’s not going to get you much traffic! So the approach that we’ve used for websites across many different niches is to try to find the sweet spot between those 2 types of keywords. We want to find good keywords for SEO that are searched for often enough to be worth targeting (often enough is subjective), and the competition is low enough that we feel like we can make our way into the top 10 results of Google. In Long Tail Pro, your first step is to add “seed keywords” and then Long Tail Pro generates hundreds of keyword ideas that are similar to the seed keywords you started with. That’s the whole point of keyword research software like Long Tail Pro – to expand on your original ideas with new keywords. But how do you find good seed keywords in the first place? 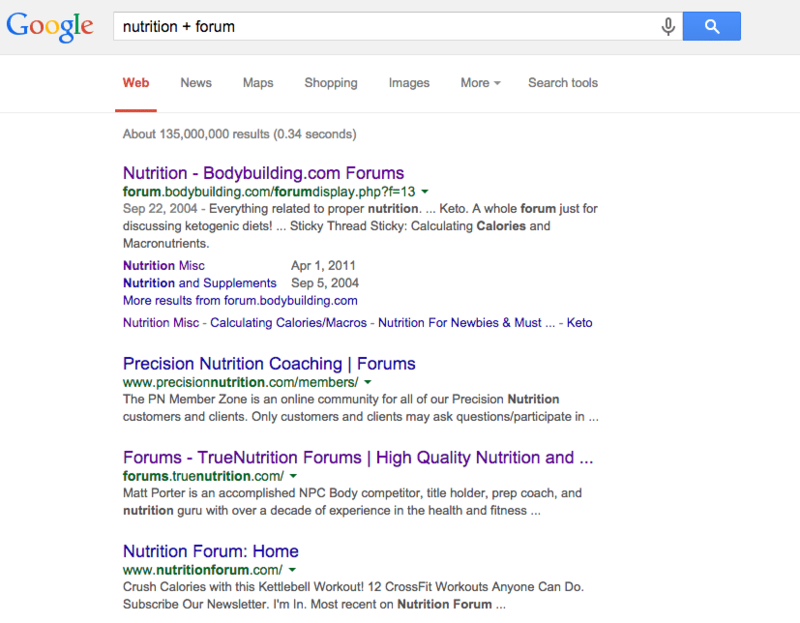 In our example, we’re looking for a great long tail keyword that we can use for our healthy eating/nutrition blog. If we’ve been in that space for awhile, we might already know some of the hot topics or industry buzz words that we could start with. In my case, let’s assume we’re just getting started in the nutrition space and are still figuring all of this out. How can I get the ideas flowing? Forums are a little old school, but you might be surprised how many still exist and are thriving. Immediately I notice “Keto” which refers to ketogenic diets. Notice that there are over 36,000 threads and 360,000 posts in this category, which is more than all the other categories combined. Since I’m just getting started, I’m going to jot “Keto” down and use it as one of my keywords. The main themes I see are Keto recipes, and some questions about certain types of foods like cheese, non-perishable, and the Keto diet in general. So at this point I’m thinking I’ll add “Keto Recipes” and something a little more general like “healthy grocery list” to see if I can find some keywords that pertain to the specific foods you should buy for Keto or other diets. For now, I’ll move to step #2 and look for a couple more seed keywords. This can be used a couple of different ways. First, you can go into different product categories and see what the top selling items are. This could be a good idea if you are looking for a product to be an affiliate of, or maybe do a review of that product on your site. What I’m going to do is search the Kindle Store, to see what kind of books are doing well in the nutrition space. The first thing that jumps out at me is “clean eating” which I’ve been hearing a lot about, and it comes up as the #1 relevant Kindle book when I do my search. I’m going to use that as a seed keyword. That gives me 5 seed keywords to start with, so I’m going to jump right into Long Tail Pro and see what I can come up with. Note: Your seed keywords do not have to be perfect, these are just idea starters. My main goal is to find things that aren’t super general – so I’d prefer “Keto” instead of “Diet” and “Clean Eating” instead of “Nutrition.” In my experience this produces more interesting results. The good news is, you can do this process over and over again to find a wide variety of keywords. I’m now going to jump into Long Tail Pro and start with my seed keywords. I’m also adding in a filter that I only want to see results that have at least 1,000 searches per month, as I don’t want to spend time on anything that gets searched less often. When I generate the keywords, I’ll start scanning the list for anything that looks interesting. By “interesting” I mean something that jumps out as a possible low competition keyword. When learning how to find the right keywords for SEO; the more keyword research you do, the more you develop a knack for quickly identifying words that have potential. If you’ve put in a seed keyword and there aren’t enough great keywords generated, you can also expand your keyword list by using a tool like Ubersuggest. Note: This image is from the original post in March 2015. 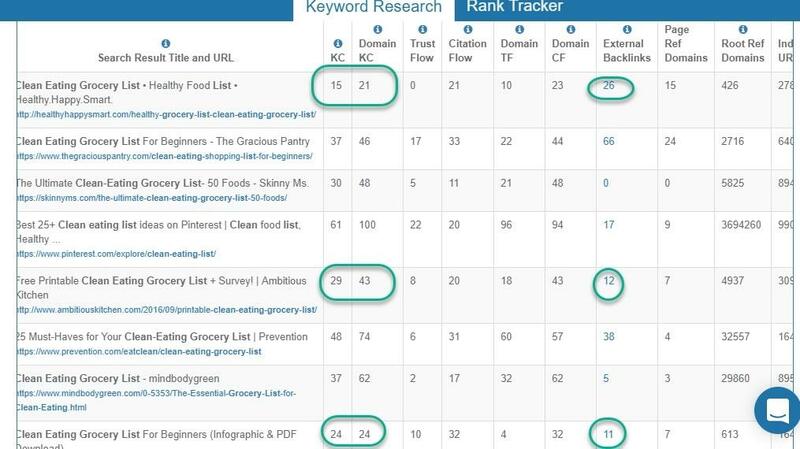 This keyword is more competitive now at a KC of 35, but we can still use this image to identify why we would choose the keyword “clean eating grocery list” from the keyword results below. – The low to mid 30’s are often medium competition keywords. This means you can rank for them, but you’ll probably need some domain authority and backlinks in addition to your on-page SEO to get there. – Around 40 and above are pretty high competition, meaning the top 10 is often dominated by high authority sites that have done a good job of zeroing in on that keyword. It may take quite a bit of time and effort to crack the top 10. At first glance, it gets searched over 5,000 times per month and it has a KC in the low 20’s – this is a great start! Now that the keyword is a bit more competitive, it may be worth a more established site to go after the keyword, but I wouldn’t recommend that you go after this particular keyword as a newer site. If you use the “Google Adwords Suggestions” feature in Long Tail Pro and enter in the exact same keywords I used earlier, you’ll find some keywords that are better to target as a newer site. But to keep the example consistent throughout this article, I’ll use the Long Tail Pro Cloud version to show you some key factors we can look for to see if this keyword is worth creating some content around. I like to see the Page KC and Domain KC under 30 or close to it. I also like to see a low number of links to the actual page. If I have an existing site, I want to add my domain to the Project, so I can see which KC ranges I should be able to play with to rank my site well for a keyword. 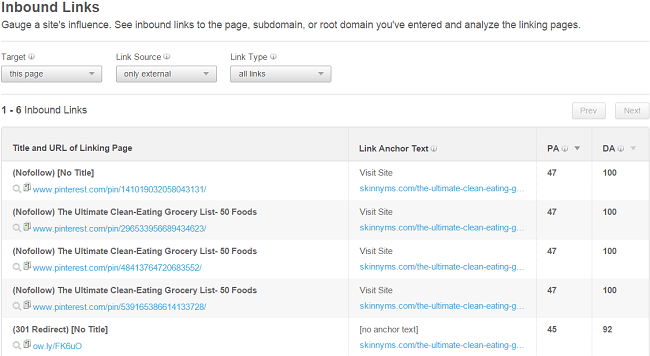 So if my domain is cleaneatsandtreats.com I want to go after keywords whose KC’s are within the 25 and 30 range. After I’ve decided on whether I’d want to target this keyword (if I were a new site, I’d probably go after a slightly smaller fish), then I want to create some AMAZING content around that keyword. We’re not going to spend much time here, but obviously putting together some short list of 5 – 10 clean eating items isn’t going to cut it. Just because you find a relatively low competition keyword doesn’t mean you can just produce anything and rank in the top 10 – it still has to be excellent content. First, producing thorough content is great for Google. 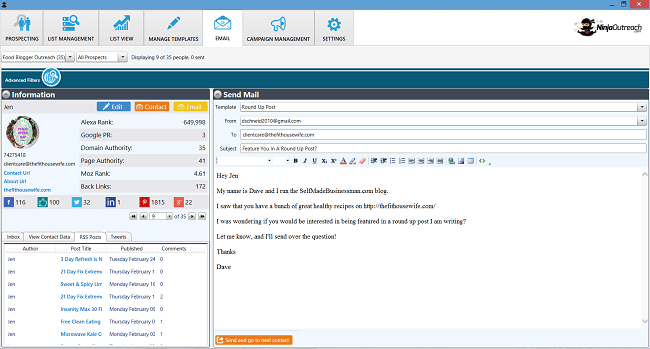 Second, producing this kind of standout content makes your outreach MUCH easier. People should want to link to and share your grocery list, because it’s the best one out there. Skyscraper Technique – The first result is a list of 50 items, maybe I make a grocery list with 100 items. I’m now going to “tag” Dave and let him show how you can take the next step. 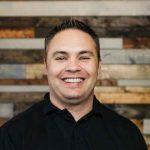 He’ll show you how you can actually use Ninja Outreach to get content for your post, and then use the tool to promote that content after you’ve published it. Now that we’ve chosen our keyword and have done some preliminary research, we’re ready to start building links. Although there are plenty of ways to build links, such as PBNs and blog commenting, this time we are going to focus on a combination of content creation and outreach. To do that, we need to understand two things. What are the people ranking for this keyword writing? Under what context are people linking to that content? From the looks of it, it appears to be a bunch of articles from food bloggers, in which they write about their own clean eating shopping lists. And I can confirm that by checking out a few of the articles like this one. Now, how are they building links for these articles? 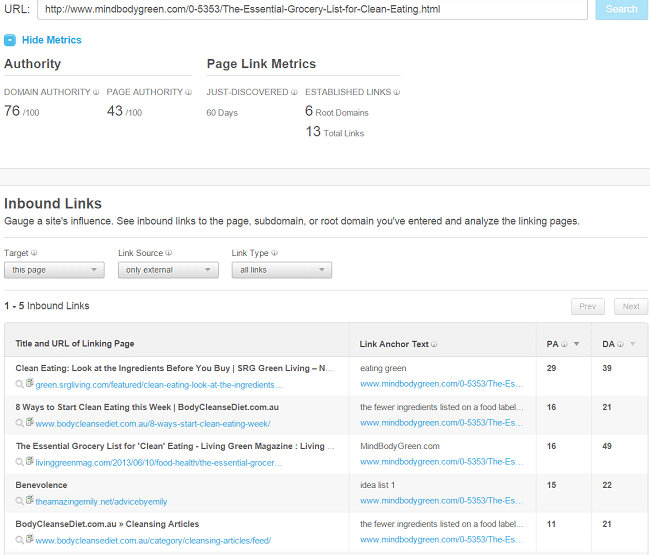 As an example I’m going to head over to OpenSiteExplorer, Moz’s tool, and input this link to see what comes back. Our intel has shown us that the top ranking websites are blogs, writing about their shopping lists, and receiving links from other blogs/Pinterest. Although the top two spots are occupied by some blogs with authority, they don’t seem to be actively link building for their specific keyword. For the most part, it appears as if they are primarily relying on their domain authority, internal linking, and simply having a relevant article. After all, many of the top ranking articles only has a few external links. While I wouldn’t say this is a slam dunk, I definitely have some ideas. Approach #1: Creating an ultimate resource guide for my keyword. How about creating a list post superior to the ones we have seen, and then shopping it around to relevant bloggers in the food niche to see if they would be willing to link to it and share it on their social media? For example, the top post is a list of 50, and the one after that is mostly bullet points. We could do the top 100 clean eating list and include images and videos? Something like that would definitely stand out and garner attention from the bloggers in this niche, and undoubtedly receive social shares and a few links. 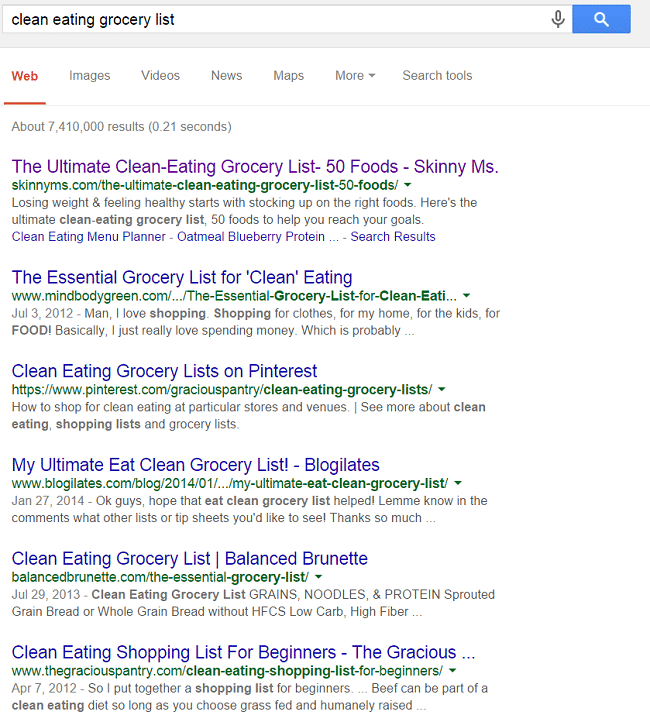 I would want to personalize my outreach to find bloggers who had already written relevant articles about clean eating, in which my list post might serve as a great resource. Another idea is to come up with a single question that I could ask dozens of bloggers. We call this a round up post, because you are organizing a bunch of experts around a single topic. The beautiful thing about this strategy is I am essentially outsourcing the content to the experts, while also inherently baking in future social sharing and linking after the post goes public from the participants. I’ve done this before in my article 39 Successful Entrepreneurs Share Their First EVER Sale And it works quite well. That article received over 400 shares and many links, and I did it when I was a nobody blogger. Nowadays, I get a steady stream of organic traffic from it for keywords such as successful entrepreneurs and first sale. Let’s run with approach number two, because it seems to be a bit more interesting, but to be honest it’s relatively similar with the exception of where the content comes from and how the pitch is designed. A question, which I have. An outreach script, which I can write in a few minutes. A list of dozens of food bloggers, including their name and contact information, who I can invite to participate in the post as well as reach out to once it is published. While the first two are pretty easy, the third part will take time. How am I going to find dozens, if not hundreds of food bloggers in my niche as well as their contact information, in a reasonable amount of time? One tool that can help with this is Ninja Outreach. With Ninja Outreach, I can put in keywords in my niche such as “healthy eating” and within minutes aggregate a list of dozens of food bloggers with their first names, contact URLs, and email. Combined with a custom template, which I can create in the software, I can start performing personalized outreach right in the tool itself. Back on the prospecting tab, select the list you want to add contacts too, and begin adding contacts. If you are looking for something specific, such as a domain authority above a certain number, or the availability of email address, you can use the advanced filter to restrict the results. You can add results one by one, or you can press Save All to add in bulk. Within minutes you can have a list of hundreds of contacts saved, often including first name, contact URL and email address. 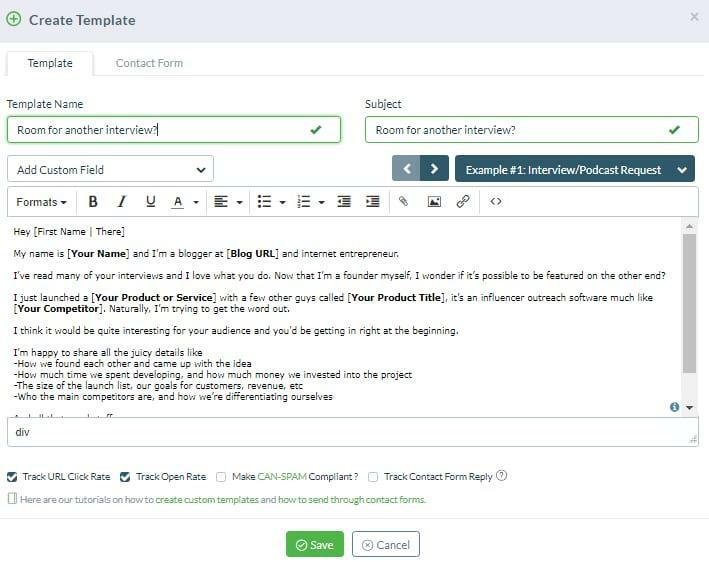 Now head over to the Manage Templates tab, and fill in your outreach script, including custom fields which can be dragged in from the right. The above was a very simple example of a script. Here is one that I sent out for the entrepreneur’s post if you are looking for another example. As you can see, the custom fields have populated, as well as the contact’s email address. Having curated the round up post, my next steps would be to reach out to all the participants as well as bloggers in the niche and inform them of the post going live to see if I can garner social shares and links. Having done this in the past, I know it can be an effective way to build natural links. This is simply one way of many to combine outreach with content creation and link building. What makes it so effective is that it is completely natural and not only within Google’s TOS, but also heavily valued. Want to use NinjaOutreach in for your outreach? 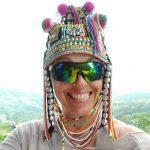 Sign up for a 14 day trail. What do you think? Have you ever done link building through outreach? Sign up to Long Tail Pro for a FREE 7 day trial. Hey Jake – thanks very much for inviting me to collaborate with you guys. This is my first tag team post and I think it came out AWESOME! Will have to do more of these things in the future. I’ve used LTP myself before when I was building niche sites and am a big fan of the software. Of course if there are any questions from the LTP audience let me know! i know this was only a hypothetical example but I hoped it might have gone into more detail on the content creation and outreach part which I think is the part where people might struggle the most. A real case study would be excellent to see too. Awesome post, guys! Very informative. Some great points on how to get the word out about your site without having to spend a ton of time building your list. And, I can see my list growing exponentially using this technique. Thanks! Looking forward to more tag team posts. Hey Dave, I appreciate that and best of luck to you. Thanks for the post it is very usefull. I have question connected with the staticcs in LTP. I have checked the KW “clean eating grocery list” and now the page 7 is still on the same spot in google but the statics are much higher. PA21 DA25 260 links and 190 juice links. Why this page is stil on the 7 spot ? Good question – it sounds like the numbers have been updated and they’ve been getting some more links. I’d guess that site will probably move up if they are getting high quality links for this page, but in the end it isn’t a perfect science. So it isn’t guaranteed that if you have X amount of links, you’ll jump in front of the next site. At this point, the KC still shows 26 and this would still be a keyword I would target and feel good about cracking the top 10 with. I have the long tail pro product but not the platinum version. Is there anything else I can do that is equivalent to the KC feature in the platinum version? Hi There – you can definitely look at the detailed analysis like page authority and domain authority, plus look at the page titles of the top 10 and see how well they target the keyword you are looking at. 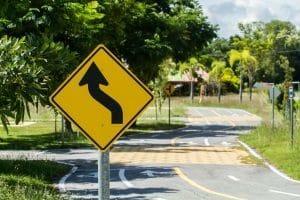 These 2 factors will give you a good idea how difficult it would be to rank for that keyword. The KC score factors those plus a couple of other things and saves you time, but you can make educated decisions without that score. I’m trying long tail pro but I need to do a search with Country=Empty and Language=Spanish (for search keywords for Spain and other southamerica countries (Mexico, Argentina…), but the keywordplanner don’t advance when Country is empty. Is posible to get a solution for this? Unfortunately, currently you would need to specify the country. Greetings! Very helpful adice within this article! Great post – very informative. Already a Platinum user and looking forward to trying Ninja Outreach when the time is right. What if your seed words don’t uncover any low competition or suitable keywords. I’m in the investing space and the competition is fierce. Suggestions? The investing space is pretty tough. It’s not a niche I would tackle if I were new to SEO. If your site already has some authority, that’s a different story. Still, even in the investing niche, there are probably still pockets of opportunity out there – it’s just a matter of digging even deeper and finding really niche topics within the broader niche to talk/write about. i using this tool form last one year and its helps me a lot in rankings.. in terms of keyword research and rankings.